Have you ever heard of people saying that homemade broth recipes can be a real life saver? My family has been making it for generations which may be the reason why my grandparents lived to be in their nineties. This beverage is an easy way to consume a mineral and vitamin rich liquid. Broths can be beneficial for joint health, digestion, hair and nail strength, cold and flu symptoms and so much more. 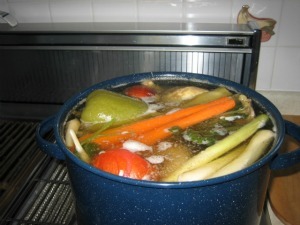 Making large pots of bone and vegetable broth was almost a weekly event. Broth was used instead of water when making soups, stews, gravy or even rice. Today it is also commonly used as a beverage when fasting for health and weight loss. People respected the therapeutic value of this homemade tonic. For a while it seemed like making homemade broth had become a lost art. But now it is extremely popular and people want to enjoy the health benefits from it. Some say it’s like a magical potion that they crave to feel good. Check out the broth recipes at the end of this article. Is there a particular day in your schedule where it is time to organize, perhaps do some laundry? How about a day when you know it will be a casual movie night at home? These are the best times to throw in all the good ingredients into the pot, cover it with water and let it cook. Some broths need to simmers for hours, so when you are near the kitchen just take a moment and check on its progress. While it is cooking you can be working on other things or simply enjoying a day of R&R. It can truly be that easy. The most popular reason why people take the time to make homemade broth is for the health benefits they provide. Bone, chicken and beef broths are known to be rich in calcium, magnesium, potassium, phosphorus, collagen, gelatin, glucosamine, chondroitin, trace minerals and much more. They are beneficial for joint health, heart health, digestive problems, immune system, cold and flu, hair and nail strength and the list goes on. Vegetable and potassium stock are mineral rich and is one of the easiest and inexpensive ways to help keep the body in balance. It provides a long list of nutrients including sodium, potassium and calcium which our bodies need to run efficiently. All broths are easily absorbed by the body because it is a liquid. This is a huge benefit if you are sick or have trouble eating. Loaded with nutrients and flavor they can be substituted for water in many recipes and are also preservative free. They are also used as a healthy beverage during fasting, illness or recovery. There is nothing better than taking your left over veggies out the fridge and making something delicious and useful from them. No more guilt throwing out those vegetables that just didn’t get used up in time. They may be a little wilted but that is okay, as long as they are not going bad yet (or are still edible) they can be used. The most popular types of stock are bone, chicken, beef, vegetable and potassium. They are all nutritious but each may differ in flavor depending on the ingredients you choose to use. Here are some homemade broth recipes that have been in my family for generations. Enjoy and reap the benefits for you and your family. We know it’s healthy, but this homemade beef broth makes an awesome French onion soup. You can also add it to soups, stews, gravies or make rice delicious. It is easy when you have the stock handy in the fridge or freezer. Homemade bone broths are not only delicious hot, but can also be served cold as a jellied consommé or aspic. Julie Childs would be so proud. Check out this simple aspic recipe that is a delicious meal on a hot summers day. This broth is a necessity if you want to make the best prize winning potato and legume soups. Get the bragging rights for creating delicious meals. It helps flush your body of unwanted toxins while adding nourishing essential vitamins and minerals. Not only is it healthy, but it is inexpensive and simple to make. No more guilty feelings about having to throw out any produce that didn’t get used up through the week.